You must make reservations at least 5 minutes in advance of the time at Gramercy Grill. You will find access to the underground pay parking lot at the rear of the building or you may prefer to park right out front as there is ample street parking in the area. Public transit stops within one and a half block - if you are staying in downtown Vancouver you would take the number 18 (The Arbutus bus) and get off at Broadway and Arbutus and walk south one and a half block - we are located at the corner of 11th and Arbutus. Any size group can be accommodated. The Gramercy Grill is a neighborhood bistro with a downtown feel. We choose to offer locally sourced, grass fed & wild products on our menus when every possible. Our commitment to you our guest is to provide a memorable meal in a comfortable room - served with a sense of humor and the skill to make it all seem effortless. Feel free to arrive early for your reservation to enjoy your favourite cocktail at our lively bar before going to your table. If it's not raining you may wish to dine on our sunny patio! I was disappointed. The wine was good value, and the appetizer + mussels were decent. My main, the duck breast, seemed like it had been reheated, and the pineapple for the sauce seemed like it came out of a can. We dined with friends for a chance to catch up and enjoy a meal together. The service was prompt, courteous and non intrusive. The food arrived quickly and great temperature. The flavours were delicious. Food was exactly what we wanted but the night was made when the server spotted we had leftover gravy and brought us extra Yorkshire puddings for our prime rib! We went to Gramercy Grill for the Dine Out Vancouver event. The food was excellent and the dine out menu was great value! The presentation of the food was not as great though. The soup was presented practically spilling over the sides as if the server had a problem bringing it to the table. The scallops and steak had an excess of a watery sauce. The tarts were good but the presentation looked slapdash at best. The service was not that good. Our server probably had too many tables to take care of. There was confusion as to who ordered what. They even made a mistake and gave us the wrong bill. We were honest and pointed out the mistake but it could have been a costly error to the restaurant. We would return for the food but the service problems prevent it from being a top restaurant. Inferior service this time. Each step of the way the waitress came back to confirm our orders. Even though she appeared to be writing down every thing, she had difficulty getting it straight. My friends steak was overcooked & chewy. I really don't understand the awful gelatinous curry eggplant sauce on top of the steelhead trout. The trout is such a nice delicate fish .. why would you destroy it with an over-powering sauce?? Service was awful. I wasn't asked if I wanted a drink with my meal. After dinner the bill was plunked on the table without asking us if we wanted coffee or tea. Service wasn't friendly & she never smiled at us. This is why we haven't eaten at Gramercy Grill for quite some time. Enjoyed our first experience at Gramercy Grill! We tried the Dine Out Vancouver menu. It was very good value for the $25 price range. I had the roast pepper soup and it was excellent! The strip loin entree was also very good and grilled expertly! There was a choice of tarts for dessert. It would have been better had they been fresh and not stored in the fridge, which made the pastry soggy. We would recommend this restaurant! Did the $25 Dine Out menu. Started with their Happy Hour at the bar then moved a few steps in to do dinner in the restaurant area, as happy hour was not permitted in the dining area during Dine Out weekends. Service and food were good, but the 3-course menu was appropriate for the price. Starter and Dessert portions were small. The food was very good and nicely plated, especially for $25! It’s a cozy, neighbourhood bar atmosphere and yet area for dining was quiet. Our service though was very sloppy and rushed. Seated 4 people at a table suitable for 2. Slow to take drinks order and IPA eventually served was more like a regular ale. Appetizers arrived promptly and were good. Meals arrived about half way through appetizers and barely ahead of the wine. Pork schnitzel too thick, very salty and served with salad (on the plate)?? Striploin average at best and mashed potatoes and fresh veg mushy. Seafood pasta Ok. For the price, this was decidedly underwhelming. Will not be going back. Went for lunch.Food good ,but portions small for the price. Ordered fish & Chips. I confirm everything I said in my previous review. It is always a pleasure to enjoy the food and the atmosphere of this place. I'll be back soon! Canadian cuisine—ok, not really much to write about, an average culinary experience. The service was very nice though. Mushroom bruschetta was very good. Steak was not high quality and cut too thin, duck breast was good, however sauce was too sweet. We were there for a Thanksgiving turkey dinner. The salad and soup and desserts were fine. Unfortunately, our main dish was not good, with no white meat, and mainly small stringy scraps of dark meat and skin smothered with a rather unpleasant gravy. The potatoes and stuffing were covered with slop too. I think other people were more fortunate, and were served with better looking meals, so maybe we were just unlucky. Our server was pleasant, but overall, not a good experience. This restaurant is an authentic gem. Far from the fancy and pompous service you would get in a typical steak-house in downtown, here you will find a friendly and authentic environment. The food is delicious. We had one of the best tenderloin steak ever, it melted in our mouth. We also ordered the 4-courses meal, which is amazing value and gives a large choice among the items of the a-la-carte menu. If you live in the area, there is no need to go downtown for an upscale quality dinner. If you don't, you may want to consider discovering this fantastic place. Food was delicious. 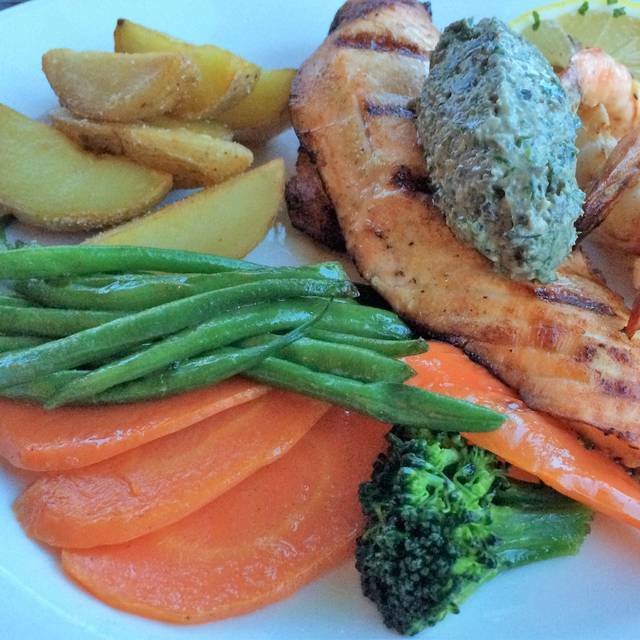 Outstanding 4 course meal for under $40 on Fridays/Saturdays. Also have prime rib on Sundays which we definitely will go back to try. Wonderful service and great ambiance. Overall great evening. Already planning next visit. I was disappointed in Gramercy Grill on this occasion. Have you eaten there many times before and been very happy with the food but I was disappointed this time. The salmon and accompanying vegetables were overly buttered however the accompanying Salsa was excellent. The service was quite unfriendly which we weren’t used to at Gramercy. After having paid my bill I was told that they forgotten to put the Tea on the bill and wanted me to tear up my visa slip and start again. I was quite surprised that they couldn’t comped something that was worth probably about $.50 when I paid $30 for my meal. It makes me think about whether not I want to go back. This is a good neighbourhood restaurant and we will be back. However four of us had pasta dishes and three of these would have been improved with more attention given to the sauces to provide a creamier or moister dish. Location is great. Strive for excellence folks! Menu choice was a bit disappointing. The featured seafood dish of the evening was Atlantic salmon. This does not appeal to me as I prefer wild salmon as opposed to farmed. I had the duck breast which was a bit chewy. The flavour was nice though. My grandson had mussels. They were the tiniest I had ever seen. His fries didn’t taste freshly made. They could have been reheated. My daughter in law and son had the beef with mashed potatoes and were happy with that. The wait staff are very nice and this restaurant is close to home so I will likely go back. I think it’s a better choice for lunch than dinner. Perhaps they’ll upgrade the quality of the food. It was our first time to the restaurant. The service was excellent. The atmosphere was nice and quiet since the place wasn't crowded at all for a Saturday night. My husband's soup wasn't nearly hot and our steaks had too much gristle in it. With our friends, we also shared an order of mussels and fries to start off our meals. The mussels were good but after the first few fries we found the fries were a bit too salty for our taste. Our friends had the lamb shank and tenderloin steaks which they enjoyed. We made last minute reservations and the hostess was gracious to seat us at table with window view. This intimate neighbourhood hang-out offers 4 course menu for $40 but did not try on this occasion. 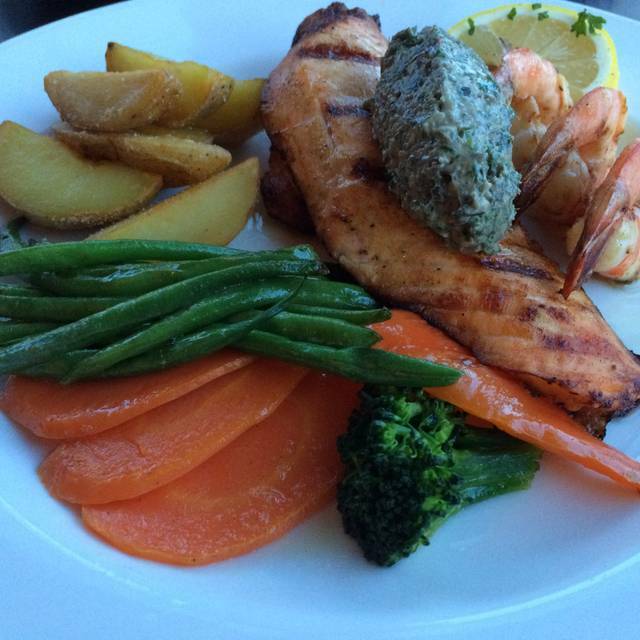 The salmon with tapenade and prawns was generous and filled the bill for seafood. Definite a throw-back to food scene when sides/ vegetables are not extras. The pork schitznel (2) was also very good. Worth another visit when the weather warms up to check out the patio. Quite local play. Older crowd. Two waitresses only, also working the bar so things took a while. Not a place to take a date. Out of a lot of the mains. Weekday regular meal place. Food ok meatballs good duck so-so. We have gone to the Gramercy grill a few times over the last 3 years and have always had great dinners and lunches. This last weekend was a poor choice of Vancouver restaurants to visit, the soups were not even luke warm, the main courses were horrible, as we both did not eat our meals. The waitress was very good, as this was not her fault at how the kitchen staff prepared the meals. Great meal as always. We picked this neighborhood gem to celebrate my birthday as we have been here several times over the years and always enjoyed the food. We appreciate the relaxed ambience, and choice of music which is not overly loud and pleasant to listen to. The venue is cozy and friendly, but not loud, so conversation is easy and yet you can't hear the folks at the next table. Our waiter was attentive, but not obtrusive. Nice that there are several GF options too. Definitely coming back. Good brunch and excellent services. Our brunch took longer than usual, so the staff gave us 20% off for the bill, this is a very nice gesture. Went for Dine Out Vancouver (DOV). The online menu for Dine Out looked good, but disappointed in the entree and dessert. Those not familiar with DOV, it's a fixed price 3 course meal (appetizer, entree, and dessert). Caesar was good, but it's hard to screw up a Caesar. Steak (2 ordered at the table) was a bit tough - even with med-rare, and wondered if it was the cut specified. Believe it was supposed to be a strip loin. Lemon tart was just so-so. Not as firm as I am accustomed too for a tart. It's a nice neighbourhood restaurant, but fell short of my expectations. It used to be that restaurants would showcase signature dishes for DOV, but this just seems to be a cash grab now. Not the only DOV restaurant that disappointed me this year. Unfortunate, because they should use this as an opportunity to woo customers to return with great food and service. Service, was fine. We had amazing service thru out our meal! I mentioned we were crammed for time & they kept to our time schedule! But maintaining quality in food & service! I’m totally going to try Gramercy again! We enjoyed the atmosphere and the food. A great neighbourhood restaurant. Gramercy is never disappointing, and the food and service are always excellent. Great food and great value! Excellent food at reasonable prices and friendly relaxed staff, what more do you need?